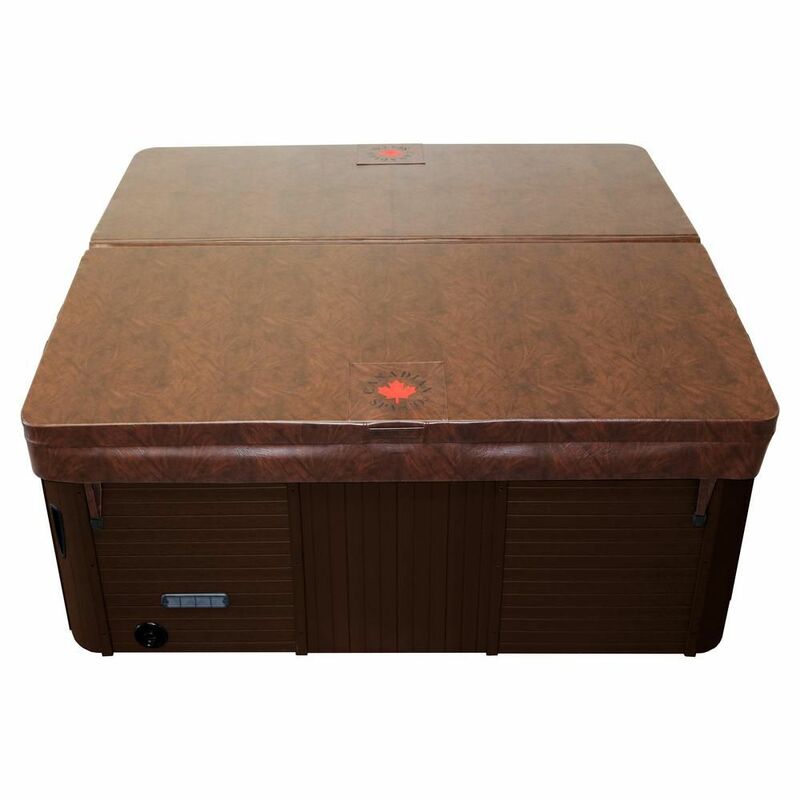 One of the best hot tub covers you can purchase is the Canadian Spa Company Square Spa Cover. This durable, thick foam cover comes from a highly regarded brand, and while this particular model is 78 x 78 inches, there are other standard sizes available to fit just about any hot tub. The Canadian Spa Company hot tub cover is 5 inches thick at the center, tapering to 3 inches on the sides. It has an aluminum support beam and is covered in marine-grade vinyl that’s UV- and mildew-resistant, so it can stand up to the elements. Additionally, it features a 5-inch skirt to create a heat seal, a full-length steam seal inside the fold, eight heavy-duty locking straps, and six reinforced handles. Reviewers say the craftsmanship on this hot tub cover in unbeatable, and it fits perfectly. Plus, the color is pretty and it keeps the water hot, just like it’s intended. What more could you ask for from a hot tub cover? Most replacement hot tub covers will cost at least $300, but if you’re on a budget, you might be able to get by with the QCA Spas Soft Hot Tub Top. Unlike most hard hot tub covers, this unique product is designed to be cut into the shape of your hot tub, and it sits right on top of the water to lock in heat. For best results, the soft hot tub top is supposed to be used with a hard top, but some people say they use it instead of one. You’ll receive an 82 x 88-inch roll of foam that you can trim to fit the shape of your spa. The cover then floats on top of the water to help it retain heat, and the closed-cell foam doesn’t absorb any water and resists chemicals. According to reviewers, this hot tub cover is easy to cut, and many say it does an amazing job retaining heat. If you’re going to use it without a hardcover, keep in mind that it may blow away on windy days! Looking to upgrade your hot tub this year? Check out our favorite hot tubs available for purchase. Don’t want to winterize your hot tub, but worried about the cover holding up against harsh winter weather? Then you need a product like The Cover Guy Deluxe Hot Tub Cover, which is specially designed to withstand heavy loads of snow and other harsh weather conditions. This is another custom-made hot tub cover, so you can specify what size, shape, and color you’d like. It features 5-inch foam that tapers to three inches on the sides, and there are a whopping 20 points of internal reinforcement, so you can rest assured it will keep your hot tub safe, even when it snows. It’s covered in marine-grade vinyl and protected by a seven-year warranty, and there are four locking tie downs so you can secure it shut when not in use. Overall, this is a great option for those who live in snowy locations and want to keep their hot tub effectively insulated. If you have a round hot tub, one of your best options is this round cover from Canadian Spa Company. They offer circular hot tub covers in a variety of sizes, including this popular 78-inch version. Just like their square covers, this product is five inches thick at the center and tapers to three inches along the sides, allowing water to run off. The high-density styrofoam will help retain water heat, and the aluminum support and vinyl finish resist even the harshest weather. This round hot tub cover comes with six locking straps, as well as a 5-inch skirt that creates an efficient heat seal. There are four handles to help you take it off, as well as a full-length steam seal to minimize heat loss. Overall, reviewers say this hot tub cover is an unbeatable value, as it’s high-quality and significantly lighter than other options. Not keen on any of the design options you’ve found? You can also get a custom-made hot tub covers, such as the BeyondNice Deluxe. This product will be customized to fit your hot tub, and you can choose from several colors to match your decor. These custom hot tub covers can be made in any size up to 96 inches and any shape. The company will contact you with directions on how to measure your hot tub, and manufacturing takes about three weeks. The standard foam cores are five inches thick in the middle, tapering to three inches at the edges, and the covers feature two nylon handles and four locking straps, as well as a non-corrosive metal support. Many reviewers say they were hesitant at first to get a custom-made hot tub cover, but most all agree that the process is straightforward and easy, and the end result is well worth the price. Hot tub covers can be fairly heavy, and if you’re tired of hauling it off each time you want to use your spa, you need a hot tub cover lift, like this model from Cover Valet. The cover lifter can be installed on a number of spa shapes, including square, rectangular, round, and octagonal, and it includes a caddy that will hold your cover, as well. The Cover Valet Spa Cover Lift is made of high-grade aluminum, and it’s gas-spring assisted to make it easier than ever to remove your hot tub cover. It can be installed within a matter of minutes, and you can adjust the height from 30 inches to 40 inches, depending on the height of your hot tub. However, it needs 36 inches of clearance to work properly, so keep this in mind as you choose a hot tub location. According to reviewers, this cover lifter is a breeze to install and incredibly easy to use. Plus, many say they’ve had the product for years, and it’s held up perfectly over time. Hardtop hot tub covers are quite expensive, and if you want to protect your investment, you may want to look into a cover guard, such as the Classic Accessories Veranda Rectangular Hot Tub Cover. This type of guard is designed to be put over your insulating hot tub cover when not in use, and it will provide an additional layer of protection against the elements—think of it as a patio furniture cover. This cover comes in several shapes and sizes, and it’s made of a heavyweight polyester fabric that’s water-repellent. It includes air vents to reduce condensation inside the guard, and it has an adjustable elastic hem cord for a tight fit. Reviewers love that it protects their hot tub covers from harsh elements and UV rays, and many say it holds up well, even in strong winds. In the market for other outdoor covers? Check out our guide to the best outdoor furniture covers. Another type of cover for your hot tub or spa is a solar blanket. These covers look similar to bubble wrap, and they’re designed to capture heat from the sun to warm up the water while providing insulation. One highly rated hot tub solar blanket is this option from Swim Time, which comes as a 7 x 8-foot sheet that you can cut to match the shape of your hot tub’s interior. The solar blanket is UV- and chemical-resistant, so it will last for years to come, and it may also help extend the life of your regular hot tub cover by reducing moisture contact. Looking for a solar cover for your pool as well? See more reviews of our favorite solar pool covers available for purchase.